As far as I know, currently the cheapest, self-contained DAB receiver available is the Evoke PURE 1 by Videologic. It is readily available for £99 from Argos, Currys, Comet etc. It comes in a wooden case with mono speaker, volume control, tuning knob and preset buttons on the front panel. On the rear are the 12V DC power input, headphones, auxiliary speaker and line out sockets. 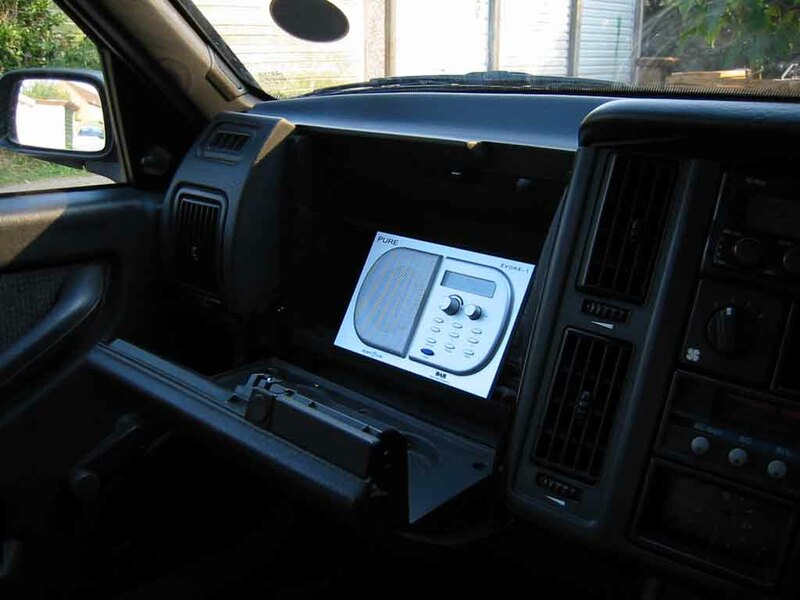 Some people have tried using portable DAB receivers in-car and it seems to work OK. I tried a borrowed Evoke placed on the passenger seat, powered by a separate 12V battery and using its indoor antenna. The results were very encouraging. This gave me the idea of using an Evoke's innards as a DAB tuner, powering it from the car's battery and feeding the audio output to the existing speakers. 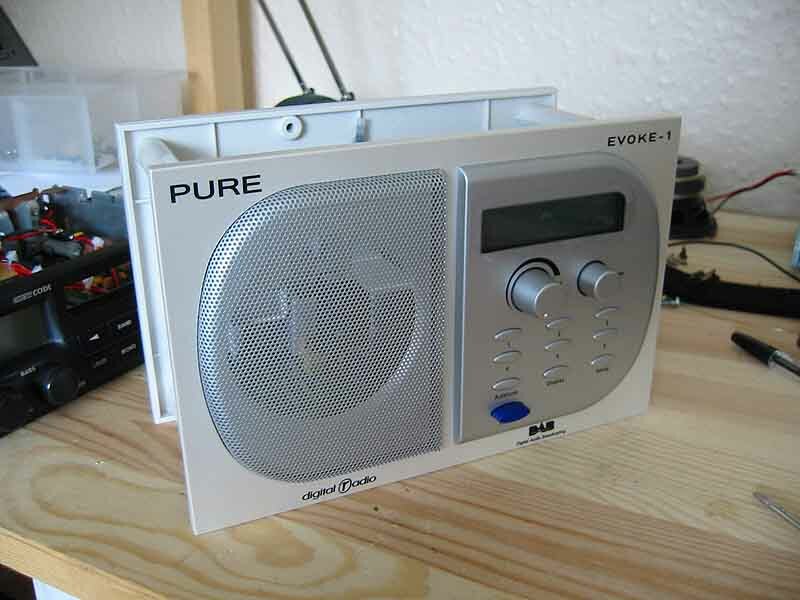 So I bought an Evoke radio from Argos. First impressions are of a very easy to use radio but with the inconvenience of having to be mains powered, supplied with an external DC adaptor unit. I listened to the audio quality carefully. Apart from the intrinsically poor quality of some highly compressed stations, the Evoke is pretty good if you use its line out socket and a separate amplifier. The in-built amplifier is hopeless, as it cuts the bass, presumably to suit the characteristics of the speaker. This also affects the headphone output. The rear panel may be detached by removing six self-tapping screws. 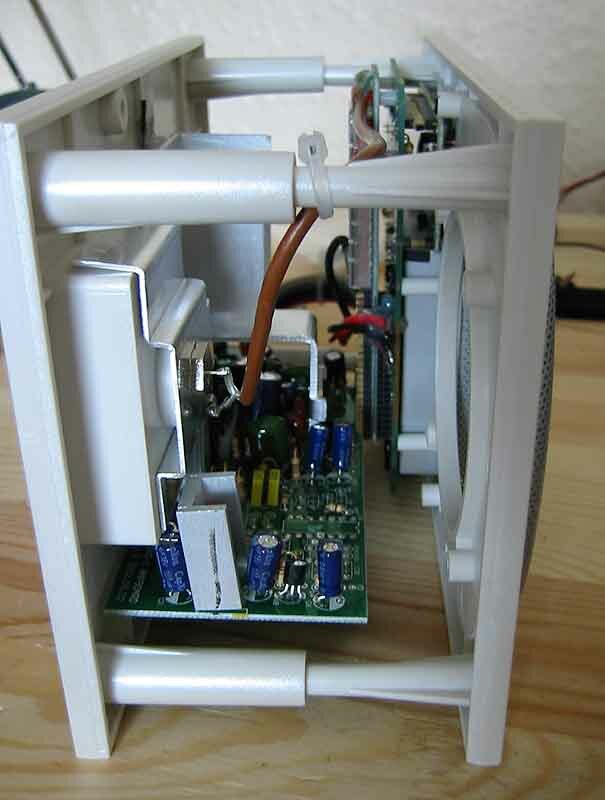 This reveals a circuit board fastened to the rear panel by two brackets, and the remainder of the unit: a bass port tube glued to the base of the box, a loudspeaker screwed to the front panel, and a sandwich of circuit boards mounted on the front panel. The front panel may be removed from the case by unscrewing two self-tapping screws at its rear. This allows the whole assembly to be removed. 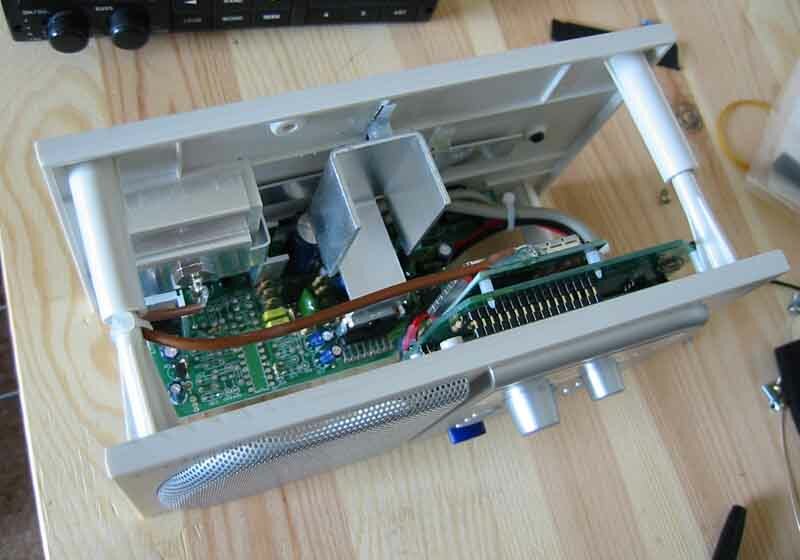 The front and rear panels may be fastened together again to give you back a complete working radio without the box. The circuit board on the rear panel appears to incorporate the stereo power amplifier and some power supply circuitry. The front boards include the RF tuner in a can, and all the electronics for the display and controls. The original idea was to see if I could extend the wiring to the controls and display and thus control the radio remotely, but I gave up on this and decided to find a place for the complete radio (without box) in the car. In the end I found it would fit perfectly in the glove box. In a small car, it isn't too difficult to reach the controls from the driver's seat, and if only listening to one station, the glove box may be left shut. I wanted to simply use the Evoke as a DAB tuner, integrated with the car's speakers, and the existing car radio for volume, tone controls and power switch. I removed the Evoke's speaker as this was very heavy and not needed. I looked in my old Volvo car radio for a place to insert the line level audio from the Evoke. It has DC-controlled volume and tone controls and I managed to find a place on the circuit board where the audio source was switched between FM and cassette. I cut some tracks and confirmed I could successfully inject an external stereo audio signal while keeping the facilities for balance, loudness, bass and treble. On even older radios, without the DC-controlled volume, you would cut some tracks and insert the line level audio at the volume potentiometer. Next, I wanted to switch the power to the Evoke using the car radio's on/off switch. This wasn't so simple, as I could see from the PCB tracks that the car radio's on/off switch was only intended to switch small currents. Also, I had read that the first Evokes had had trouble with their own power switches due to the high surge current at power on. I decided to fit a high side driver IC (effectively a solid state relay) so that I would only have to draw a small current from the car radio's power switch. Below is the circuit I used when installing the radio in the car. 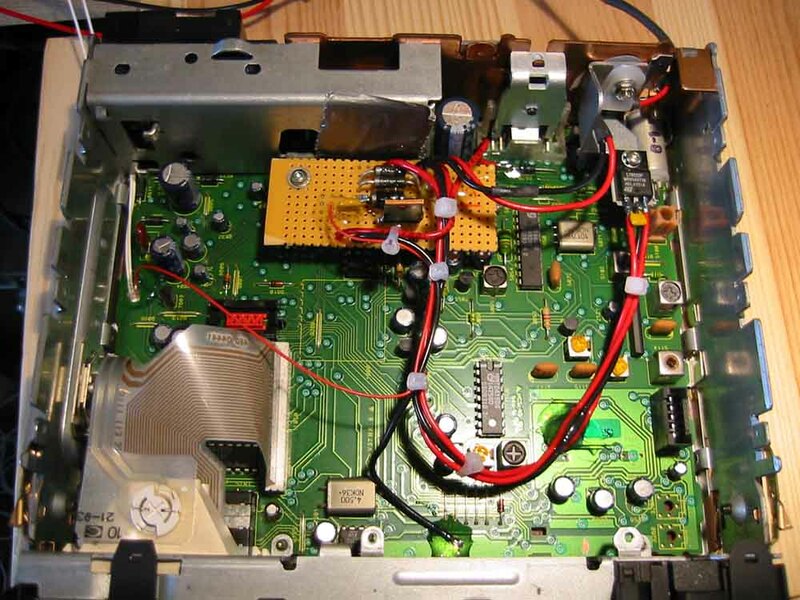 The general idea is to generate a 12V regulated power supply for the radio, and to protect it from the usual automotive hazards: reversed battery, unpleasant "spikes" and transients on the power lines. Unswitched car battery power is tapped from the old car radio. Fuse F1 is a solid state resettable type rated at 1.1A, (but a conventional fuse would do). D1 and D2 are 24V 5W zener diodes. These will absorb any high voltage spikes on the incoming power line, and in the unlikely event of a sustained voltage of higher than 24V will trip the fuse. D3 is a high power rectifier and protects against the possibility of a reversed battery. It does this without causing a voltage drop which would have been the case with a series diode. IC1 is the high side switch which is turned on by a low current signal on its IN pin. This is derived from the car radio's switched 12V. (If you are confident your car radio on/off switch can handle the load of the Evoke, or are using separate means to switch the power to the Evoke, IC1 may be omitted). The switched high current 12V feeds a linear voltage regulator, IC2. Special "low dropout" versions are available which still manage to regulate down to about 12.5V input. The standard version used here cannot regulate when the input is less than 14V. For a 12V input, the output drops to about 10.4V when under a load of 400mA. Be careful to glue down anything which may be prone to problems with vibration. In particular I noticed that the power amplifier IC in the Evoke had a large heatsink which could flap about. I glued this to the rear panel. The Evoke's antenna socket is an 'F' connector, like a satellite receiver connector. I bought a car aerial extension lead from Halfords and chopped off the plug and most of the lead. I fitted a satellite plug connector to the remainder. This allowed me to connect my car's aerial to the Evoke. If you calculate the required length for a quarter wave antenna for the DAB band it works out at about 34cm. I found that shortening the car aerial to this length improved reception greatly. I found that I got hum and noise on the audio if I connected grounds between the Evoke and the car radio with both the power connector and the audio screen. Connecting the audio lead's screen only at one end cured this. The Evoke draws about 400mA at 12V. Using a 12V regulator in the car means that about (15-12) * 0.4 = 1.2W of heat must be dissipated on average. I clamped the voltage regulator to a convenient bit of the radio's chassis as a heatsink. No heatsink is required for the high side driver IC. As mentioned before, less than 12V is available from the regulator when the car engine is not running (about 10.4V in my system). The Evoke seems to be unaffected by this. I don't suppose the Evoke is designed for extremes of temperature. It might be best to remove it from your car if it's going to be parked in very hot or cold weather. I have found that using the car's antenna (adjusted to the right length) the signal reception is very good indeed. Yesterday I drove from Cambridge to Coventry and back, listening to 6Music all the way, and had perfect reception throughout. I didn't even hear glitches when going under motorway bridges. The audio quality is very good if you use the Evoke's line out and a reasonable stereo amplifier and speakers. In a car, the quality is subjectively "CD" on some stations. Listening to Radio 3 in a moving vehicle I found that the dynamic range was too wide - the quiet passages were inaudible against the vehicle noise. But of course, the Evoke allows you to set the "DRC" (Dynamic Range Compression) to 0, 1/2 or 1 for any station. The default value is 0 (which is what you would want in a quiet environment). Setting it to 1 for some stations improves matters no end in the moving car.